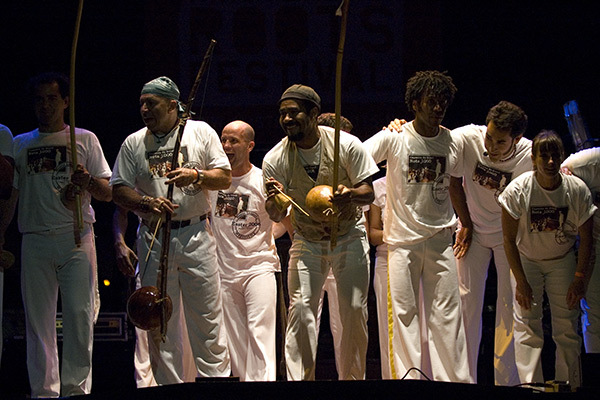 The musical score of QUILOMBO was written by Composer Gilberto Gil. A leader of the tropicalia movement in Brazil in 1967 and 1968, along with artists like Caetano Veloso and Gal Costa, Gilberto Gil and other musicians mixed native styles with rock and folk instruments. Because Gil fused samba, salsa, and bossa nova with rock and folk music, he is recognized today as one of the pioneers in world music. A multi-instrumentalist and singer/songwriter, Gil joined his first group, the Desafinados, in the mid-50s and by the beginning of the 1960s was earning a living as a jingle composer. Although known mostly as a guitarist, he also holds his own with drums, trumpet, and accordion. He began playing the accordion when he was eight, and he listened to street singers in the marketplace around Salvador. By the end of the 1950s, Gil was studying business administration at Salvador's Federal University and playing with a group called Os Desafinados. At this time he heard singer and guitarist João Gilberto on the radio and was so impressed that he immediately bought a guitar and learned to play and sing the bossa nova. He spent the early 60s composing songs for TV ads, and in 1964, he was in Nos Por Exemplo, a show of bossa nova and traditional Brazilian songs directed by Caetano Veloso. In 1965, he moved to São Paulo, and after singing and playing in various shows, he had his first hit when singer Elis Regina recorded his song "Louvacao." He began to establish himself as a singer of protest songs, and he became very popular with Brazilians involved in the Tropicalia movement, which opened up native Brazilian folk music to other kinds of influences. The success of the single "Louvacao" inspired Gil to record an album of his own material with the same title. Gil made his first self-titled recording in 1966, but his first hit single didn't come about until 1969, with "Aquele Abraco." His musical fusion of bossa nova, samba, and other styles was so revolutionary it frightened the country's military dictatorship into arresting him, and that's when he headed to Great Britain. (He and Caetano Veloso were placed in solitary confinement while authorities figured out what they wanted to do with the pair.) After three years in England, where he had the chance to work with groups like Pink Floyd, Yes, the Incredible String Band, and the Rod Stewart band in London clubs, he returned to Brazil in 1972. He recorded Expresso 2222, which spurred two hit singles in Brazil, "Back in Bahia" and "Oriente." After playing at the Midem Festival in France in 1973, Gil recorded Ao Vivo in 1974. A year later, he recorded with Jorge Ben for the album Gil & Jorge. In 1976, he toured with Veloso, Gal Costa, and Maria Bethânia and released the Doces Báraros album. For most of the rest of the 1970s, he recorded for a variety of Brazilian record companies until signing an international deal with the WEA group of labels in 1977. He toured U.S. colleges in 1978 and firmly established his place in the international jazz world with his albums Nightingale (1978) and Realce (1979). 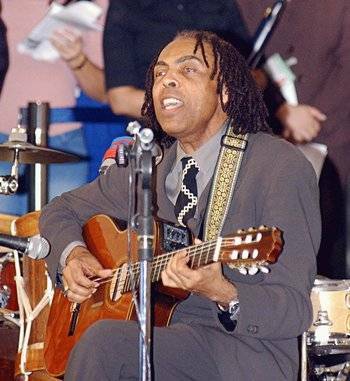 He also released a double live album in 1978, Gilberto Gil ao Vivo em Montreux, recorded during his performances at the jazz and blues festival in Switzerland. In 1980, Gil teamed up with reggae musician Jimmy Cliff. The pair toured Brazil, and cover of Bob Marley by Gil "No Woman, No Cry" climbed to number one, selling 700,000 copies. Gil followed up in 1981 with Luar (A Gente Precisa Ver o Luar), one of his most acclaimed recordings. In 1982, he performed again at the Montreux festival, but this time with Jimmy Cliff. 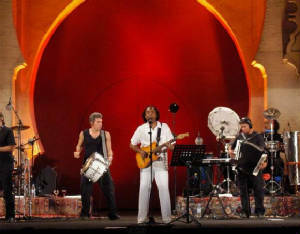 He followed up with Um Banda Um (1982), Extra (1983), and Raça Humana (1984), the last recorded with Bob Marley's Wailers.